Crystal Beach Cyclone roller coaster. Dear anonymous correspondent yesterday, I am going to crown you, as my mother used to say. Because at 6 a.m. this morning I checked out the link you sent. I never should have! First of all I wound up riding the Comet before I had even had my coffee! The video is of riding the old Comet roller coaster, at Crystal Beach. I could not look away. Second of all I wound up riding it five times! And not being able to work! I love how whoever made the movie didn't fit it out with any dumb rock songs. There is some annoying little music, but mostly they let you hear the clack-clack-clack of the tracks. Who doesn't remember that? Then you get to see the lake. And the bored kids in their '70s clothes waiting at the end of the line to help the riders out of the cars. You know what also hit me, speaking of that? When you're watching the video, and the train pulls into the station when the ride is over, you get that sinking feeling in your stomach. The sense of oh, darn, the ride's over. That feeling is still there. And it is exactly the same. I mentioned Crystal Beach yesterday because Leonard Pennario and I used to talk about it. Before I met Pennario in person, we were making friends with each other and making plans for his visit here. He said: "And can we go to Crystal Beach?" I said, "Mr. Pennario, I have bad news for you." That was terrible to have to tell him and Pennario took the news badly, the way we all did. The way we all continue to do! Has anyone ever gotten over the loss of that park? Isn't it awful now how it is replaced by those white-bread condos? They are a sickening sight. I am ashamed of my nostalgia for Crystal Beach. It is a very old-fogie thing and besides, I only caught the park at the end of its life anyway. My dad used to tell me the Comet was nothing next to the Cyclone. Pennario used to tell me that too. Pennario swore up and down that he rode on the Cyclone even though I argued him, I said he couldn't have, he would have been too young. He was only 10 when his family moved to California. Now that Pennario is gone, and I am working on the book without him, it sometimes occurs to me that I should have spent more time quizzing him about Mozart and less time eating ice cream with him, going to the movies and gabbing about the Heyday and the Tumble Bug. When you watch the Comet video, check out the comments. One slug writes: "My dad used to love this peace of crap roller coaster." I do not like to use the word "crap" on my blog but I had to in this case. I love how the dummies are always betrayed by their spelling, grammar and punctuation. That is a beautiful thing about the Internet. Crystal Beach opens a galaxy of time-wasting possibilities. Its fans love to chronicle it on the Internet. George, my brother, found a site devoted to the Laff in the Dark, by an incredible geek who writes about every gear and pulley involved in the ride's construction. Click here for the site. Then kiss your work day goodbye. I already did that, hours ago. Mary--- I sent you a link to YouTube.com a few months ago with the very same thing! It was a video of riding the Comet!! Plus, there is one on their for riding the Yellow Coaster. 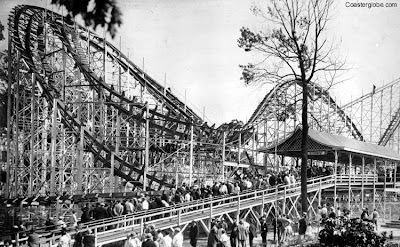 It was EXACTLY as I remembered it-- the one or two times I got to ride it before they tore it down. I was hunting the internet for old Buffalo photographs and stumbled on it. I cannot believe you blogged about that! I can't remember my ! @#$)*)^%*& password for google name. Geez. I am SOOO tired of having to remember all these "identities" and "screennames" and passwords and "logins". Aren't you?